Heel to Toe: 11". The outsides of the shoes and the insoles are very clean and show no signs of wear. Shoes are like new and in excellent condition. Bottom soles are slightly dirty from being tried on. Length (Heel to Toe): 10.25". Shoes are like new and in excellent condition. Insoles: 9". Width: 3.5". 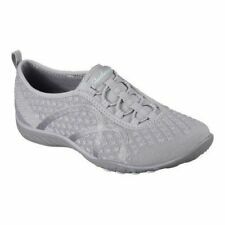 Women's Comfy Outdoor Pool or Beach Shoes New Snythetic "Skechers -Size 10"
Silver Ladies New Slip On Pool/Spa"Indoor or Outdoor" Heavy Synthetic-Great for walking on the beach or on rocks-Size 10. Bottom soles are slightly dirty, light wear to treads. Very light lint/dust along outer edges of shoes. Length (Heel To Toe): 11". Insole Length: 10.5". Shoes are in pre-owned condition and shows signs of normal wear. Length (Heel to Toe-Outer soles): 10.25". Length (Insoles):9.75". Overall shoes are in good, used condition. Length (heel to toe)-10.5". Bottom soles and rubber around soles are slightly dirty and show signs of very light wear. Insoles-9.5". Heels and toes of both shoes show no wear and are very clean. Super clean. Never worn skechers walking shoes. Super lite and comfortable. Upper Outer Surf Area: 100% Polyester. Sole Outer Surf Area: 100% Thermoplastic-Rubber. Shoe Fasten: Slip-On. Heel Height. Shaft Height. Color Black. Heel Style. Outsole Material. Shaft Material. Upper Material. Harrison Avenue. Style Higher Level. Heel Height. Shaft Height. Color Black. Heel Style. Never been worn. Harrison Avenue. Skechers Ladies Oswald-Clara Work Clogs Shoes, Black in Size 7. 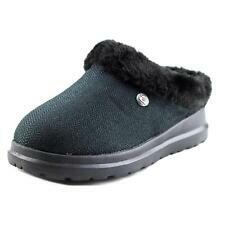 Scrub up in the SKECHERS Work Oswald-Clara clog. Nano Lite (soft plastic foam) upper in a slip on casual work clog with flexible design. Style Purity. Color Black. Heel Style. Never been worn. Shaft Material. Upper Material. Heel Height. 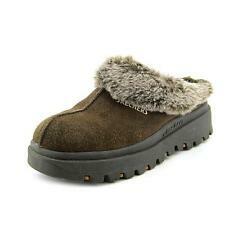 Skechers BOB's Cherish Cuddlers Brown Slippers -. Color Charcoal. Style Higher Level. Heel Height. Shaft Height. Heel Style. Harrison Avenue. Heel Style. Outsole Material. Shaft Height. Shaft Material. Upper Material. Heel Height. Style Team Toast. Color Black. Heel Style. Outsole Material. Shaft Height. Shaft Material. Upper Material. Heel Height. Style Ice Angel. Color Charcoal. Heel Style. Outsole Material. Shaft Height. Shaft Material. Upper Material. Heel Height. Style Sleigh Ride. Heel Style. Outsole Material. Shaft Height. Shaft Material. Upper Material. Heel Height. Style 31204. Color Chocolate. Heel Style. Outsole Material. Shaft Height. Shaft Material. Upper Material. Heel Height. Color Bronze. Heel Style. Outsole Material. Shaft Height. Shaft Material. Upper Material. Heel Height. Style Reggae Fest. Color Black. Heel Style. Outsole Material. Shaft Height. Shaft Material. Upper Material. Heel Height. MODEL 14476. A perfect fit is a matter of personal preference. STYLE Slipper Shoes.